Get your modern suit acquired the right way with a fine wool modern style fit suit by Alberto Nardoni. 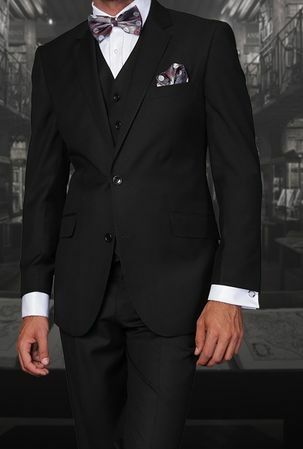 This solid black 3 piece suit has all features you want like a modern fit jacket with pick stitch detail, side vents and of course flat front pants. Made of fine super 150s wool and modern fit of course.